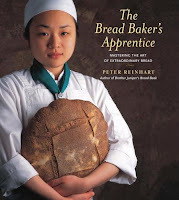 Each week I am making a bread recipe from Peter Reinhart’s wonderful book, The Bread Baker's Apprentice: Mastering the Art of Extraordinary Bread. The second bread in the Bread Baker's Apprentice Challenge was Artos: Greek Celebration Bread. The Greeks are always celebrating something. Any excuse to get together with friends, family and great food. We should all be a little more Greek. There are several variations of this bread, each one for a specific celebration. I chose to do the Christopsomos version. 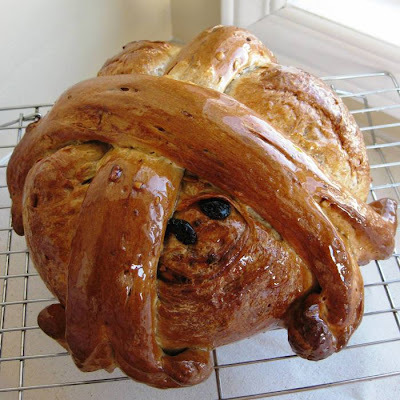 It is traditionally served at Christmas and has a 'unique bread-dough cross laminated on top of a round loaf'. The glaze on the bread crust is made with water, sugar, honey and lemon. It gives this bread a gorgeous shiny surface. This bread is scented with cinnamon, cloves, nutmeg and allspice. It smells amazing. I added some raisins, dried cranberries and toasted walnuts. I can't wait to make this one again. This bread will be going to my nieces who are half Greek. I hope they like it as much as I do. Be sure to check out what the other challenge participants have done. I saw this bread over at Natashya's blog, too...it is just gorgeous! The glaze is so pretty...I'm so jealous of you fabulous bread bakers! This bread is truly fit for a King. You get better and better and better and better and better and better and better and better and better and better and better and better and better and better and better all the time. Nice job on the Artos, nicely done. I just bought the book today and I can't believe how amazing this book is. I really wish I could take on the BBA challenge with other food bloggers but I have to juggle work, fitness and cooking. Good luck on your quest of completing the recipes of this book! Wowww wat a fabulous bread, looks amazing! Beautiful , i did the basic celebration bread and it was so yumm so i can imagine how dleicous this would be with all the fruits in them. A beautiful bread! Really yummy looking! The glaze gave it such a nice colours! I would love to get hold of the book now! Gorgeous gorgeous bread. I love the sheen on top. admire anyone with such obvious bread making skill! now that's a great quest! you have a great knack for bread making. A very nice rendition and you're right - we're always celebrating something. I think Greece has like, top 3 most statutory holidays. what a lovely bread. It is amazing. Wow Dragon... an amazing and beautiful bread. I would have loved to be near your oven to smell the fantastic aroma!!!!! I think that we Spaniards might be celebrating even more holidays than the Greeks! Or so! Fiesta! wow, beautiful! 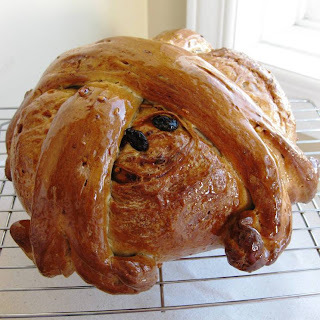 my mom's family makes a bread similar to this for their saint's day. I love the glaze and all the goodies it's stuffed with - it looks incredible! I love the shape of this gorgeous and delicious bread! Oh, WOW! Now I wish I was Greek! Your bread turned out very cool, congrats on your beautiful bread. That bread is craaazy looking, but I like it. I want to sink my teeth into it. Bagels are scaring me but I can think of way more uses for them then the anadama and artos. Wow, this looks absolutely amazing. You did a beautiful job. Just look at that color and glaze. Lovely! The bread sounds absolutely delicious! I love the dried cranberries and all the flavors in it. Love the glaze you used. Sounds perfect! Your Christopsomos looks perfect! I really liked the flavors of this bread. Peter would love your stating that we should all be a little more Greek! That is the most gorgeous bread I've ever seen! I really need to get out my copy of this book and bake from it more often! Your bread is so gorgeous! I really liked this one & that glaze...YUM! Your Artos is so beautiful ! complimenti !! !